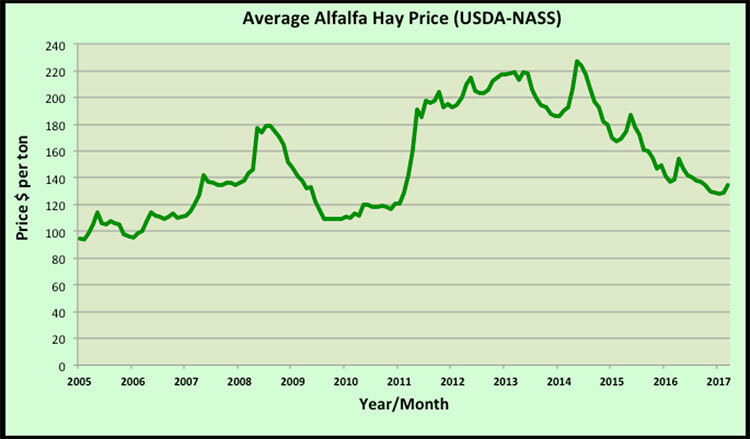 All-hay and alfalfa March hay price averages moved higher for the second month in a row based on USDA’s most recent Agricultural Prices report released last week. The all-hay price was $132 per ton, up $6 per ton from the previous month but $4 lower than March 2016. Hay other than alfalfa was up $5 per ton from $122 to $127, which is $1 per ton higher than March 2016. The month-to-month alfalfa price was up $6 per ton in March to $135 per ton, which is $4 per ton less than one year ago. After finishing $1 per ton higher in February, this is the first consecutive month-to-month price upturn since April and May 2016. Last year, the USDA alfalfa hay price climbed from $137 in February to $154 per ton in April, then plummeted to $129 per ton by the end of the year. Though a spring rise in hay price is typical, there are at least some indications that hay values might hold some strength in 2017. 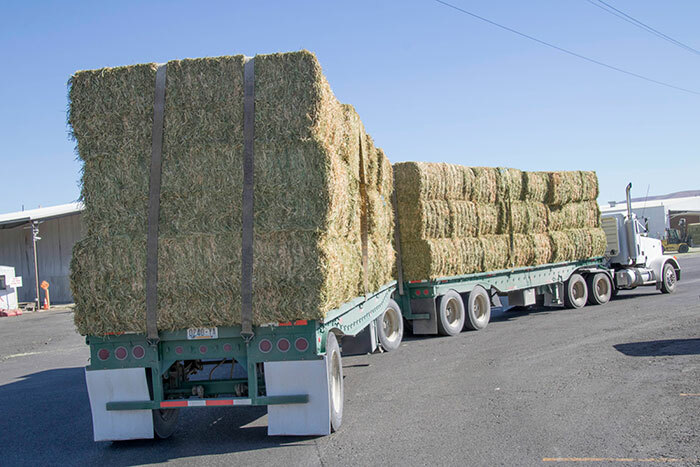 In last week’s eHay Weekly, Seth Hoyt reported that the current California delivered prices on new crop alfalfa hay into Tulare-Hanford dairies are $15 to $25 higher than a year ago. There have also been more reports of alfalfa winterkill in the Midwest to go along with USDA’s projection of fewer overall hay acres in 2017. Though the outlook for milk prices for 2017 is not quite as optimistic as once thought, they should still improve as we move out of the “spring flush” period. 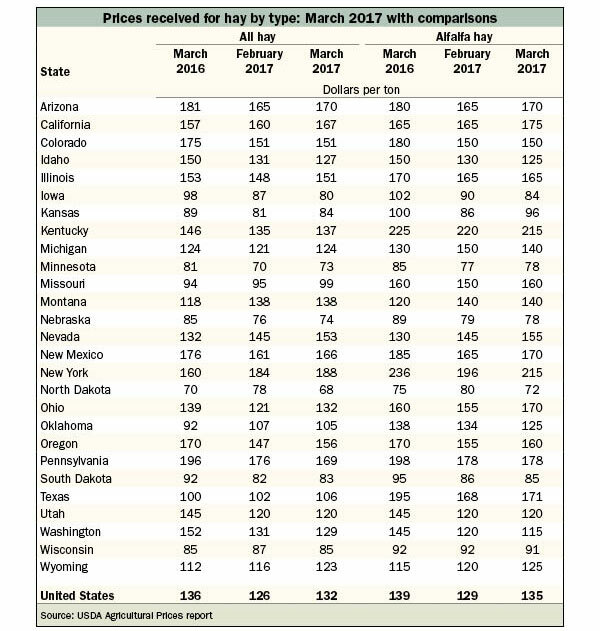 The largest alfalfa price gainers in March were New York (plus $19 per ton), Ohio (plus $15), California (plus $10), Kansas (plus $10), Missouri (plus $10), and Nevada (plus $10). Oklahoma led price declines at minus $9 per ton, followed by North Dakota at minus $8. The highest alfalfa hay prices are being reported from Kentucky and New York ($215 per ton), Pennsylvania ($178 per ton), California ($175 per ton), and Texas ($171 per ton). Arizona, New Mexico, and Ohio all came in at $170 per ton. The lowest prices can be found in North Dakota ($72 per ton), Minnesota ($78 per ton), and Nebraska ($78 per ton).